Ask DST #204 – Minimates Are Go! Want some Minimate answers? Because DST Chuck is up for your questions! Is there any chance you guys will ever make minimates of The Hunger Games? DST Chuck: I am not sure that’s a property we’d normally look at but as it turns out we were talking to them about some stuff when it was just a literary property and they were not interested in Minimates. So along that same line, I was wondering if any thought had been given to including any of Steve’s supporting cast into the minimate line. Characters like Sharon Carter, Falcon, Winter Soldier, Dr. Faustus, The Sleeper, and Sin are sorely missing from collection, just to name a few, and I know how you guys are fans of the “theme” waves, so that would be a great way to bang out a bunch all at once! P.S.- My wife is a big Captain America fan too, and she keeps asking me why I don’t have an Agent 13. Help me make her happy! DST Chuck: I would think with the movie coming in 2014 you will see more comic Cap Minimates and there are a couple bigger ones we did not do last time around. Hey guys, I’ve loved Minimates since before C3 (which I also loved!). Here’s the thing: WE WANT AIRWOLF!!! You had questioned interest in this in a previous Ask DST, so I have a few points to offer as proof. One) In a cursory search online I found at least a half dozen requests for “The Lady” w/Hawke and Santini. 2) Airwolf is now streaming on Netflix, generating worldwide interest this franchise. And third and most importantly…I WANT ONE!!!!!! Seriously though, this one would be really great if you guys could make it happen. Thanks. DST Chuck: I’ve got to be honest with you and I LOVED that show when I was a kid – if our sales guy can get enough interest going I’d totally be game. Hey guys, me again! Since you are going to make Alien Minimates, have you ever had plans or thought to make Predator ones? I absolutely love predator, and I think you guys would make pretty nice looking ones. Possibly even AVP ones. Also, hypothetically speaking IF you were going to make them, would you just release predator minimates like how neca does their predator figures, or would you make the human characters like dutch, blain, mac etc. Thanks! DST Chuck: We’ve had lots of talks with Fox about both properties. We finally found a way to crack Aliens so you never know but at this time it’s not feasible. At one point we got as far as line planning a Predator line (I did it) SO I can safely say yes it would include humans if we ever did the line. Hello! I’m back with yet another question(or questions depends on what pops into my head while i’m writting this)!Recently i talked with BBC’s marketing(or licencing) supervisor so naturally i asked him about Dr Who minimates. He seemed really intrigued by the idea and he said that he would pass it on BBC since they were looking into branching out in new toy lines since it’s Who’s 50th anniversary. I know you’ve talked with BBC before and did that Underground Toys thing but i’d give it another shot now. Who knows? Maybe things have changed. We know that you have designed minimates for more disney properties. What are the chances of us seeing them happen and/or getting more disney minimates? Will you reveal any new lines at SDCC or earlier? An a Marvel question to complete things, do the next series or waves (after 52) have a theme or are they random characters? I’d like a modern hawkeye and/or modern secret avengers. That’s it for today. Have a nice day! DST Chuck: All I can tell you is we have had multiple conversations with BBC EU and they have no interest in pursuing this and Underground did not find enough interest in the states for them to want to go forward. Remember though, never say never. The only full Disney line we ever did designs for is Peter Pan. Nothing else cooking at this moment for Disney. I am sure we will have something new for MM at SDCC or before, if that is what you are asking. We’ve not locked down the rest of the year – though we should have by now – for Marvel Minimates. DST Chuck: Nolan, right now we have no rights to DC product so that would not be possible at this time. I think we’d love to make another Marvel one at some point. I was curious if DST had any plans on releasing the remaining Fear Is Worthy characters? I personally don’t care about the Mighty, just the Worthy. Attuma, Absorbing Man, and Titania. I have the remaining hammer wielders and would love to round off the whole crew. Please? DST Chuck: I think for now we’re done with Mighty and Worthy but never know. A while back you guys released rock music minimates consisting of Alice Cooper, Rob Zombie, Iron Maiden, Ozzy Osbourne, and Kiss. Is there any chance of a revival of that series? DST Chuck: John, from time to time we look back into music products but the market and how to sell the music category and related products has changed so much we’ve not been able to reach a new deal. 2012 was a fantastic year for Minimates. One of the highlights was completing the Alpha Flight line-up in such a short space of time. Having the two box sets & TRU 2-pack all released in quick succession was very exciting. Is it possible we’ll see this system of release used again in the future for larger teams of characters? It’d be a great way to get out larger casts of characters like X-Factor, the Mutant Liberation Front or Generation X.
DST Chuck: No way to tell if we can duplicate that – it really took a partner like AFX to step up and commit to pull something like that off. Do you guys have plans for any new Back to the future Minimates for 2013? I know a lot of us Back to the future/Minimates fans are waiting for Griff & Gang 4 pack with hoverboards and such. I think sales for that set would sky rocket. DST Chuck: Right now we have no plans for anymore BTTF sets – sorry. Since fans have been harassing you guys for years about the omission of Star Trek: Enterprise Doctor Phlox and Hoshi Sato figures in their duty uniforms, if the new Star Trek Minimates line should be a success, are those two characters anywhere near the top of the list of future choices for the series? It would be great to finally get those characters in their duty uniforms, even if not exactly the same type of figure as the previous Enterprise figures. Also, any chance of a cool “Star Treks Captains” boxed Minimates 4-pack set that could include the more popular captains (Kirk and Picard) along with finally giving us our first DST Captain Janeway product? DST Chuck: Not making something as an action figure will have no bearing on if they will be made as a Minimate. 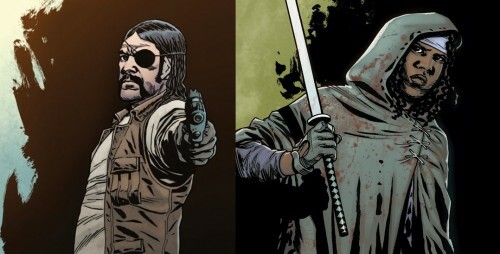 Everette H. In the Walking Dead comic, Rick rides both a horse and a motorbike at different points. These are both long desired items by fans of some of the other Minimate lines. So how about it? Maybe a convention exclusive with Rick and a horse? Or Rick and a motorbike? I’m in for multiple purchases on either. 2 movies. An animated television series. A toy line. Name that property! Ghostbusters? Well, yeah, but it also describes Bill and Ted’s Excellent Adventure. Which would make excellent Minimates, don’t you think? DST Chuck: There has been much talk of someday doing a horse so you never know… Right now no plans for Bill & Ted but we have nothing against that property so you never know. Ask DST #200: Can you believe we’ve made it this far? Minimates!